We talk a lot about advancements in headphones and earbuds here at Techlicious, but earplugs have made a number of technological leaps these days as well. Need proof? Look no further than the new DUBS Acoustic Filters from Doppler Labs – they’re designed to protect your ears from damaging levels of sound without sacrificing its fidelity. 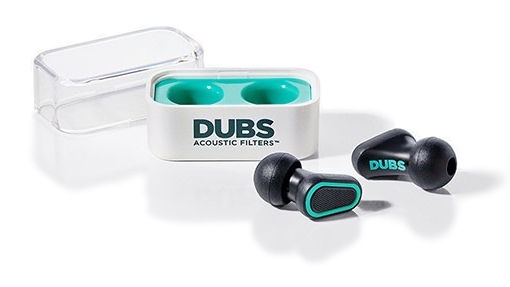 As you might expect, acoustic engineer-designed DUBS Acoustic Filters are a lot more than the usual shaped pieces of foam that pass for earplugs these days. They’re made of 17 individual parts – premium materials like stainless steel, ABS, polymer foam and silicone. But at the same time, they’re inexpensive, no bigger than traditional earplugs and still small enough to fit in your pocket. DUBS Acoustic Filters work through a process called dynamic attenuation. Sound flows through a combination of high and low pass filters, targeting specific frequencies to reduce volume while maintaining clarity. On average, you can expect a pair of DUBS to cut volume by 12dB, enough to make the difference between safe listening and hearing damage. Aside from function, its style that really makes DUBS Acoustic Filters stand out. They look more like an ultramodern Bluetooth accessory than a piece of safety equipment. DUBS are perfect for concerts, nights out in a noisy club or anywhere else you might be self-conscious about your appearance. Then again, is there really any scenario where an ugly piece of yellow foam sticking out of your ear is appropriate? DUBS Acoustic Filters are available in four colors (teal, blue, pink and white) carry an MSRP of just $25. You can order your pair of DUBS Acoustic Filters today by visiting the company’s website at www.getDUBS.com. You can also purchase a pair in retail stores like Best Buy beginning November 3. The delivery date was a day late and I missed using this product at the concert I was intending to use them at. Beyond that, the product once received is very poor. The devices are so small that they do not fit my ears and I had to place them so far into my ear to get a closure that they got stuck and I had to have help getting them out. I simply cannot believe that your team would ship a product knowing the vast majority of the population does not have petite elf ears that your devices do not properly fit. The whole idea behind your product is to block sound and to do so you MUST have a proper fit. I am sorry to say these DUBS without proper fit are worthless and dangerous as the black end piece came off inside my ear and had to be removed with hemostats. Disappointed to say the least.